Today’s recipe is so darn good that I absolutely am wasting no time in sharing it with you. 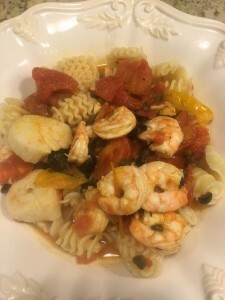 I made it for dinner last night and just had to get it out there today. It truly is delicious and if you were to order this dish in a restaurant you’d pay top dollar for it! 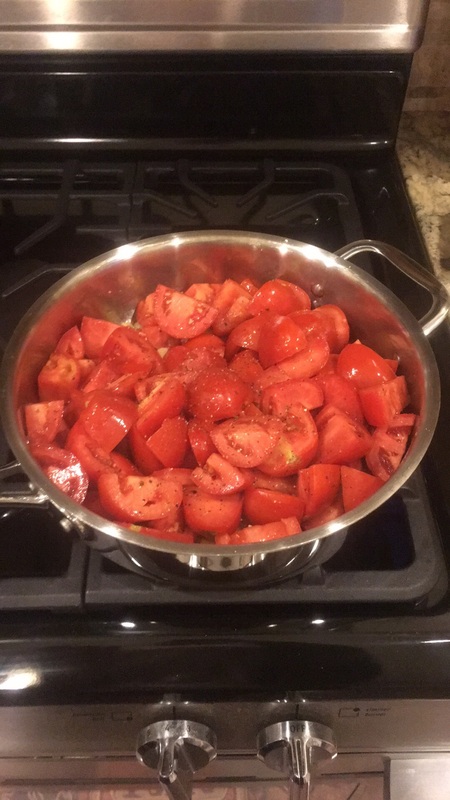 This is a perfect dish this time of year because tomatoes are in season and ready to be harvested if you garden or just pick up a bushel or two at your local farmers market. I had this imported pasta from Italy, of course, that I was saving for a special dinner and sauce. 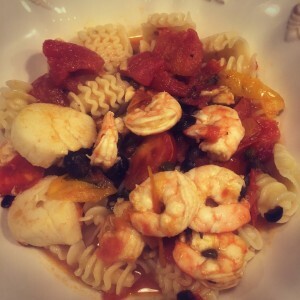 It is Radiatori pasta and it’s so good! I was craving a light, fresh sauce and some seafood. So, with that in mind, I put together some of my favorite things and made this amazing dish. My husband literally wiped his plate clean so that is a very big inclination as to just how amazing it was. I hope you enjoy it as much as we did. If your shrimp is frozen you have to first thaw it out before cooking. You can do this by letting it refrigerate overnight or place frozen shrimp in a colander with cool water and let it sit for 30 minutes. Change the cool water every 10 minutes. Chop up and quarter your tomatoes and set aside. It doesn’t matter how big or small you chop them that is entirely up to you. I go rustic and make them all different sizes. In a sauce pan heat up your olive oil and when heated through add your garlic. 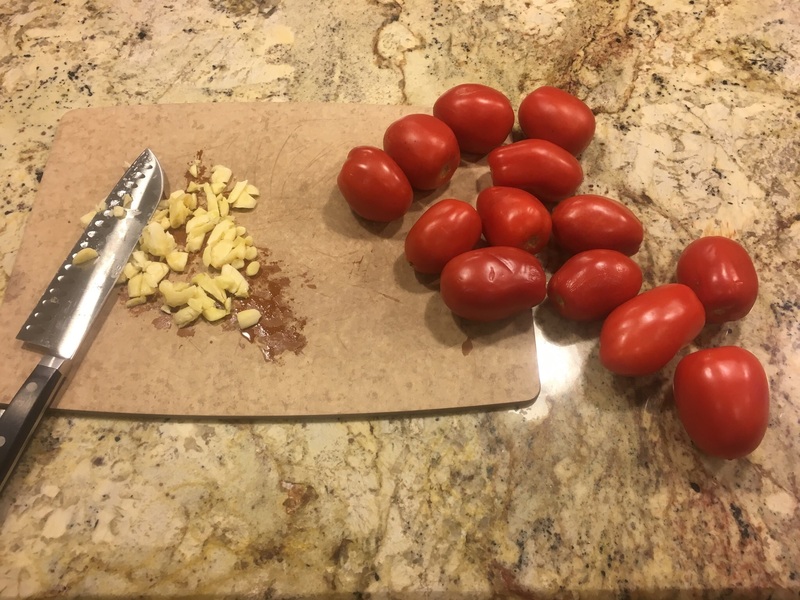 When garlic is a little brown, add all your tomatoes. Season with lots of salt and pepper. If you want a little spiciness to this dish add some crushed red pepper flakes. Let this cook down for about 30-4o minutes on low. Stir often. 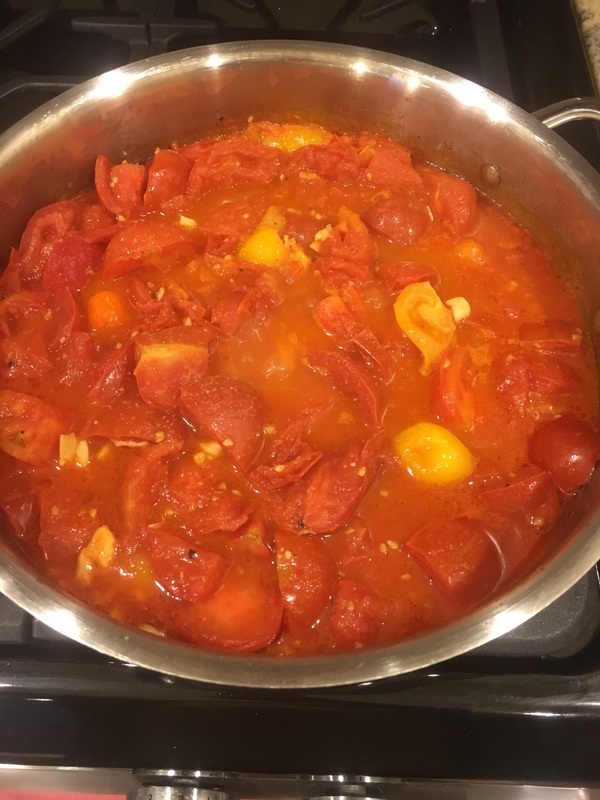 You can tell when it is done when the tomatoes are soft and it just gets a little bit of a saucy look to it. 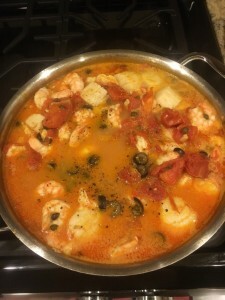 When cooked down, add your capers and olives and mix through. 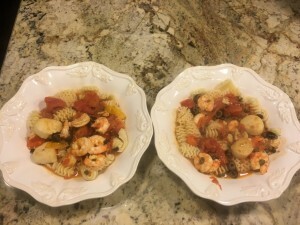 Add your scallops and shrimp and mix through. I took the tials off of each shrimp when they were thawed and before throwing in the sauce. I think it just makes a nicer presentation that way and its easier to eat. The fish cooks quite quickly in the sauce so put it in right when you are almost ready to eat. You will know when the fish is cooked because its color changes from translucent to white. 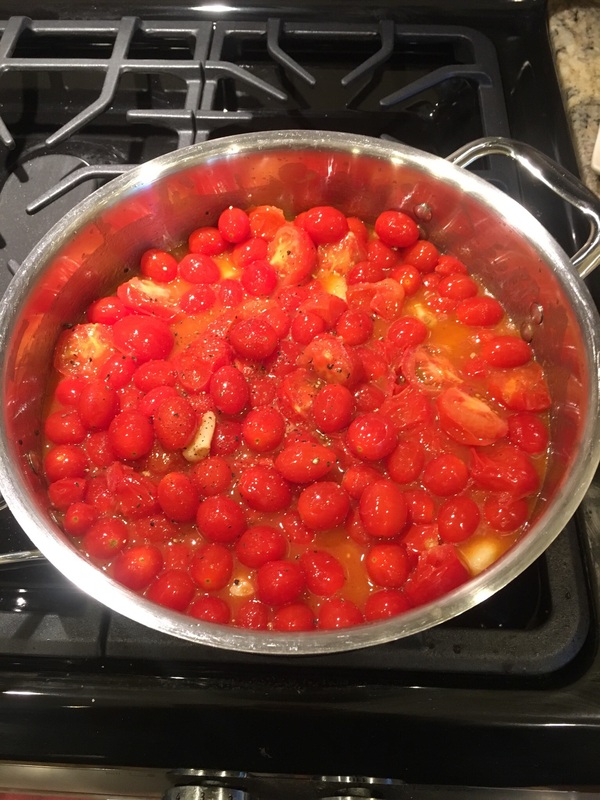 Don’t forget to boil your water for your pasta and cook to al dente. 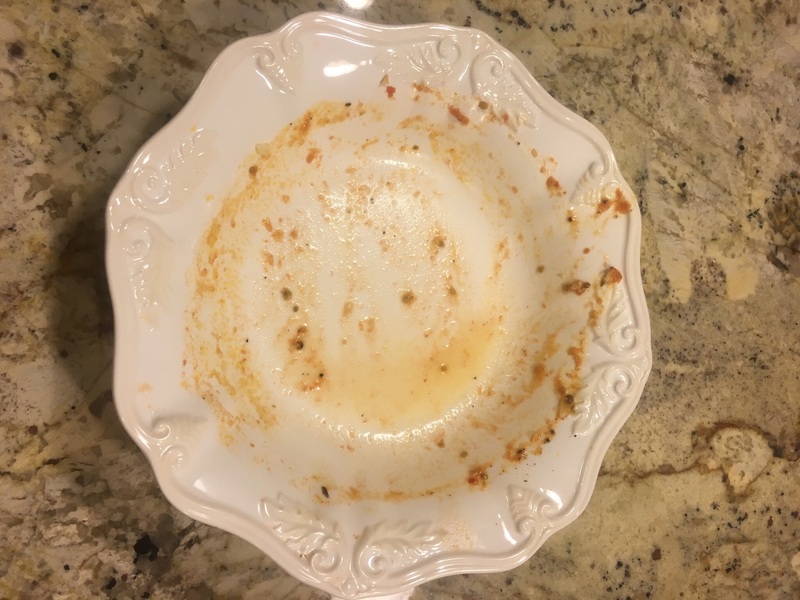 When all is done add the pasta to individual serving bowls and then spoon in the fish sauce over it. Mix and serve! Delicious! This entry was posted in Dinners!, Pasta and tagged fish sauce. 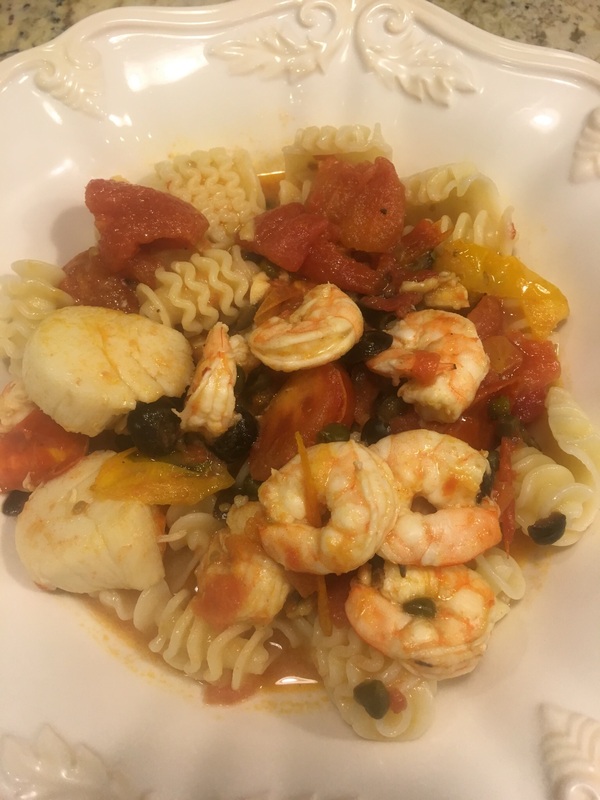 seafood sauce, pasta, seafood puttanesca.